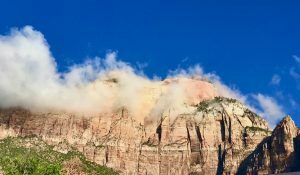 Want to know where to stay when visiting Zion National Park? When visiting Zion National Park (nps.gov/zion) stay in Springdale!! What an adorable town! Springdale has no franchise restaurants, no street lights, and artists’ shops galore. We loved staying at the Best Western in Springdale. Our room had a wonderful view and a small terrace with chairs for watching the stars. The hotel has two outdoor fire pits which capped off perfect days in the Park. There is a fitness room and a free hot breakfast to boot. All the shops and restaurants are within walking distance and the shuttle to the Park stops directly across the street and, when returning to town from the Park, stops right in front of the hotel. access to the scenic drive is by Shuttle only. option.The Springdale Shuttle stops at nine different locations in town. Bookstore, Gift Shop and more. 4. 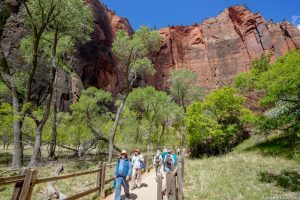 Be prepared for a line to board the free Shuttles that stop at nine locations on the Zion Canyon Scenic Drive within the Park. You can board and get off at any of the shuttle stops all day long. Shuttles are free and wheelchair accessible. The shuttles run as often as every 7 minutes. Located at the entrance is the Zion Canyon Brew Pub which serves a fabulous brat sandwich with red cabbage! Sit outside and be mesmerized by the views! 5. Zion is magnificent!!! Even if you don’t hike or trek, make your way into the park and find a spot to sit and watch the light play off the cliffs. The Zion Lodge Shuttle Stop has a wonderful cafeteria-style eatery with views and an outdoor terrace. A huge lawn shaded by ancient trees was covered with families sitting, napping, doing yoga and talking the day we were there. We stayed there until the sun set behind the cliffs-it was a perfect day. Being oldies (not of good physique), we chose trails in Zion that were classified as “easy” or wheelchair accessible. Our favorite was the River Walk (last stop on the Shuttle) and one day we stayed for hours soaking in the sun, the peace and quiet and sounds of rushing water. It was heaven! We attempted the hike to the lower Emerald Pool on a hot day and although rated as easy, the incline was tough. We passed a woman having a great deal of trouble with her asthma and by the time she was half-way down, she was in real trouble with chest pains and shortness of breath. Her friends poured water over her head and made her drink but it was clear that help was needed fast. Someone had gone for a Ranger, but the wait turned long so we also went for help. The Rescue Squad arrived with loaded backpacks moving quickly up the trail with two more rescue personnel close behind with a sling-back rolling chair gizmo for patient removal. Seven more rangers arrived with a rolling gurney. Thankfully, she came down the trail looking much better than she had looked up on the trail. She was loaded into an ambulance. We heard of several rescue operations during our 3 days in the Park. Be forewarned-know your limits and take more water with you than you think you will ever need. Back in town, if you are ready for lunch or dinner, don’t miss Blondie’s Diner (hours: M-Sat. 11-8 p.m.) in a 1930’s 2-bedroom house where six daughters were raised. Staff there are a delight and we giggled our way through inexpensive and tasty home cooking. Don’t forget the homemade pie! Yum! Our favorite may have been Casa De Amigos where we had $2.99 soft tacos with seasoned pork that melted in our mouths! After dinner, cross the street to the Springdale Candy Company, the chocolate shop where you can pick up a hot chocolate made with Belgian chocolate if it is cool out. If hot, choose some ice cream. If neither, what the heck, choose some of the countless house-made chocolates for dessert! Finish your hikes early if you want dinner in town-no one stays open much after 9 p.m. but Porter’s Smokehouse (M-Sunday 7 a.m.-8 p.m. (open til 9 p.m. on Friday and Saturdays) let us in late and the ribs/prime rib sandwiches hit the spot! Or, make your way to Pizza & Noodles (open 4 pm. til closing 7 days per week)-a tradition in Springdale that has homemade crust on their 12” pizza.The view from Pizza & Noodles (once an old church) is out of this world! There are views from everywhere in town-it is a stunning place. The colors at sunset were indescribable and the views majestic! The upper ends of the road are not plowed in winter but below 6,000 feet, winter driving should be snow-free. Highway 9 is a scenic delight with Springdale and Zion National Park one of our new favorite spots in America. 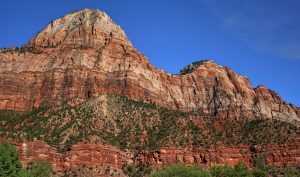 Question: Where did you stay while visiting Zion National Park? Teach all of us! Thank you.